The University of Washington Bothell held its 3rd annual Reaching American Indian Nations (RAIN) event Friday, February 6. It was a day dedicated to preparing American Indian, Alaskan Native, and First Nations students with the tools necessary to access higher education. Students interacted with UW Bothell and Cascadia College students, staff and faculty, engaged with speakers, and participated in cultural and educational workshops. Native high school students and faculty from Native American educational programs from all across Washington State were invited to attend RAIN 2015. Amongst those who attended were tribal students from Tulalip, Puyallup, Yakima, Port Gamble S’Klallam, La Conner, Central Kitsap, Edmonds Indian program, and representatives from Tacoma. This year’s RAIN attendance was by far the highest in its history. In 2013, the first year RAIN was held, only Tulalip Heritage high school students were participants. The following year there were roughly 55-60 students from tribes all over the state. This year the attendance nearly doubled with an estimated 110 Native students participating. The inspiration that led to UW Bothell creating RAIN three years ago happened right here on the Tulalip Reservation. It was during a routine admission workshop that Rachael Meares was undertaking at Tulalip Heritage High School that inspiration struck. 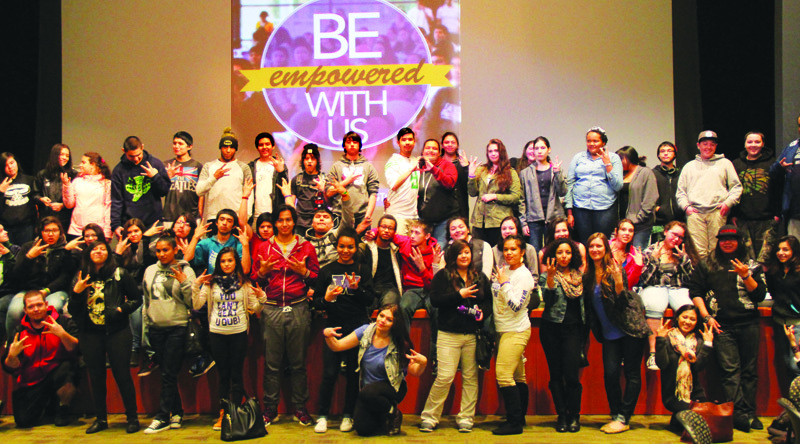 The junior and senior high school students at Tulalip Heritage were so eager to participate in her workshop and to learn of the opportunities available at UW Bothell that Meares thought it would be really beneficial for the students to spend a day at the UW Bothell campus, participating in various workshops, exploring and learning about the campus, and receiving an alternative college perspective that wouldn’t otherwise be available to them here on the reservation. A few months later, the entire Tulalip Heritage High School student body, with chaperoning teachers, spent a day at the UW Bothell campus learning about the university and opportunities available only a short thirty minute drive south on I-5. That day marked the first culturally relevant outreach event for Native American students, which was given the name Reaching American Indian Nations, or more commonly referred to as RAIN. The next year Meares and her colleagues from the UW Bothell Division of Enrollment Management extended invites to Tulalip Heritage and other tribal schools across Washington. The event has continued to grow with an increasing number of tribal students attending and more workshops being offered. “Before RAIN our Native American student admission numbers were like five, six, or ten some years. Now we have eighty-three Native American students enrolled and attending UW Bothell. Our Native American student population has grown a lot over the last few years and we want to continue building upon that momentum RAIN has given us,” states Meares, who also carries the title of Admissions Advisor and Recruiter for UW Bothell. At this year’s RAIN event the keynote speaker was the Executive Director of Chief Seattle Club, and member of the Pawnee tribe, Colleen Echohawk who gave a very passionate speech to her tribal student audience. Echohawk told her story of growing up in remote Alaska, not just living off the land but living with it, and how attending college opened up opportunities she had never imagined. After a light breakfast, introductions of the coordinating event staff, and the keynote speech, the students chose two out of five available on-site workshops to attend. Keeping the idea of cultural relevancy in play, each workshop was specifically tailored to the Native American student pursuing higher education. The workshops were also led by a Native American staff members of UW Bothell. “Paying for College” Financial Aid and Funding Resources workshop was led by Danette Iyall (Nez Perce), Director of Financial Aid. This workshop provided a unique opportunity for the students to meet with UW Bothell’s Director of Financial Aid to learn about the many ways to fund their education through grants, scholarships, loans and more. Students were introduced to the FAFSA as well as University funding resources such as the Husky Promise. “Airplanes” Opportunities at Boeing workshop was led by Dr. Deanna Kennedy (Cherokee), UW Bothell Assistant Professor. This workshop allowing the tribal students to experience the interactive UW Bothell student classroom. Students got a feel of the UW Bothell classroom lecture about Boeing productions processes and learned first-hand about academic approaches in the School of Business and career pathways. “Pathways to College” was led by Sara Gomez Taylor, Cascadia College Outreach Specialist. Students learned about the admissions process and the vast opportunities for academic growth from representatives from three college settings; 2-year institution, 4-year institution, and Tribal College. UW Bothell Wetlands Tour was led by Alice Tsoodle (Kiowa), Islandwood Instructor and UW Bothell Alum. Students learned about the restoration design and how the campus and students have influenced the UW Bothell ecosystem. Participants left with a better understanding of how this campus resource is used in the classroom. The fifth workshop offered was the Campus Tour led by current UW Bothell students. The campus visitors got to see all that UW Bothell has to offer thought current student perspective; classrooms, café’s, housing, sports field, library, and much more. A highlight of the campus tour was a walkthrough of the 3-story high student library. The UW Bothell student library features Native American artwork from tribal artists near and far. For the students participating in the tour they were happy to see artwork from their culture being so stunningly displayed throughout the campus library. Among the tribal student attendees was Oceana Alday, Tulalip tribal member and current senior at Marysville Getchell High School. She is also a Running Start student in her 3rd quarter at Northwest Indian College. Alday expressed her enthusiasm for RAIN and hopes more Tulalip high school students attend in the future. This entry was posted in Education, Tulalip News and tagged Art, Native American, rain, Reaching American Indian Nations, student, Tulalip Tribes, University of Washington Bothell by Kim Kalliber. Bookmark the permalink.